This is one of Elsie's paintings. How cute, right! Remember the days of making tents in the living room with all the sheets in the house? Mom used to help us move all the furniture around so that we could then use scrunchies to tie the sheets to the chairs, table legs, anything that would stay put really. 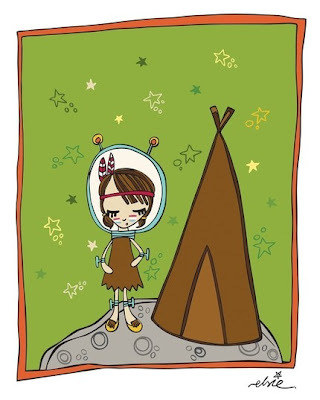 I'm not sure when I decided but I've decided that I want a tepee. Rachel made one for her kiddo that is oh so cute and I want one in my backyard on day. Ah hem, I'd also like a back yard to put it in for that matter.